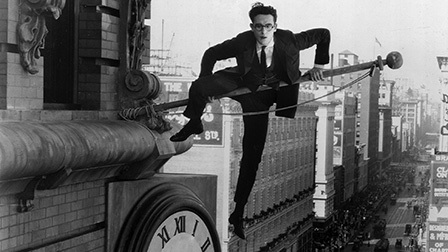 Harold Lloyd clocks his rise to success in Safety Last! Silent movie star Harold Lloyd lets loose with a torrent of perfectly executed gags and astonishing stunts in the 1923 comedy classic Safety Last!. In the film, Lloyd plays a small-town bumpkin trying to make it in the big city, who finds employment as a lowly department-store clerk. He comes up with a wild publicity stunt to draw attention to the store, resulting in an incredible feat of derring-do on his part that gets him started on the climb to success. Directed by Fred C. Newmeyer and Sam Taylor, Safety Last! is the first Harold Lloyd film to be released by the Criterion Collection since the Lloyd catalog was acquired by Janus Films in 2012. Janus Films will tour Safety Last! theatrically starting in April to celebrate the ninetieth anniversary of its Release, and to kick off an ongoing celebration of the legendary silent comedian. Buy or Rent Safety Last!